Hey there! Today I have a great new stamping plate brand with some really fun images and great quality. 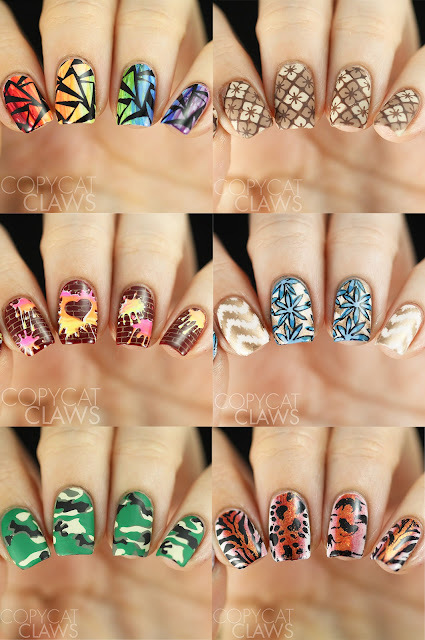 Lina Nail Art Supplies' online store opened about a month ago and I've seen so many awesome manis using her plates. I was lucky enough to be sent three of her plates to try out and I have to say, I'm impressed. With all the stamping brands out there these days, it sometimes feels like everything has already been done but Lina's brand has contradicted that. I was so inspired by these images. A couple of the manis I've done are so fun! I wore the splatter one for days and hated to take it off. Follow the jump to read all the details. 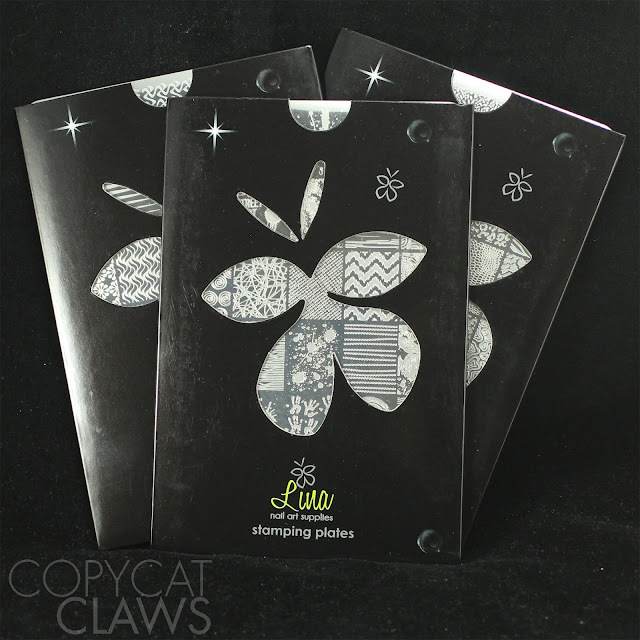 Lina Nail Art Supplies plates are 9.5 x 14.5 cm with the images measuring ~18 x 22 mm. 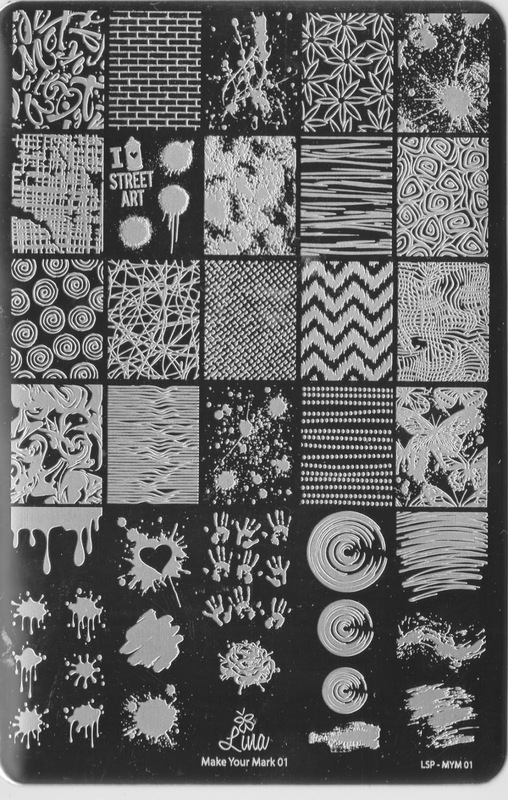 Each plate has room for just over 23 images but Make Your Mark 01 has a variety of images, down to the ~6 mm hands and splatters. The plates come in a sleeves with pretty butterfly cutouts covered with a clear plastic film. Don't forget to remove that film since it's less noticeable than the usual blue film. The Feeling Shapely series has the largest number of plates so far. 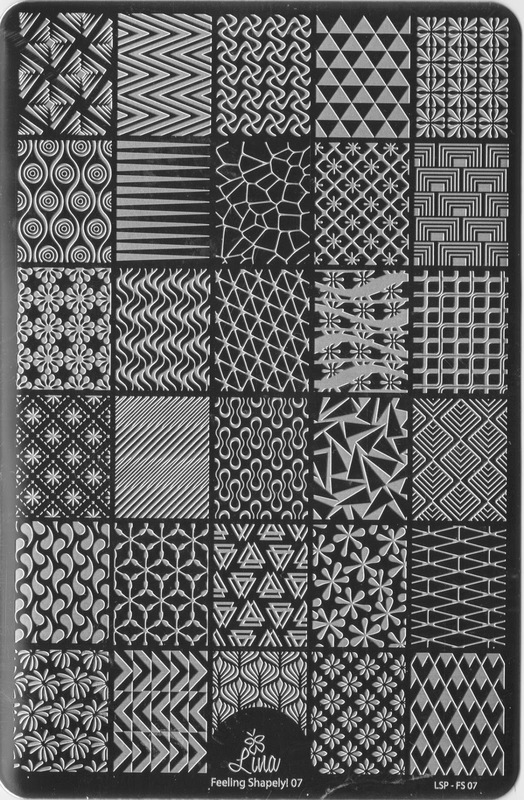 07 has a range of geometric images but there's a few floral patterns thrown in there as well. For anyone new to stamping, the Feeling Shapely series is a good place to start your collection since some of the other plates has some must have images. Purple - Sally Hansen Lacey Lilac, OPI Casino Royale, Vant To Bite My Neck? With how colourful my first design was, I went the opposite for my second Feeling Shapely design. I made stamping decals using Revlon Dominate as my stamping polish, filled with OPI You're So Vain-illa and Zoya Flynn, matted with Essie Matte About You. I literally just read the description of Make Your Mark 01 which says it's inspired by 90's trends - no wonder I like it so much. I'm totally a 90's girl. There's also some strong graffiti imagery here which are my favourite images on this plate. 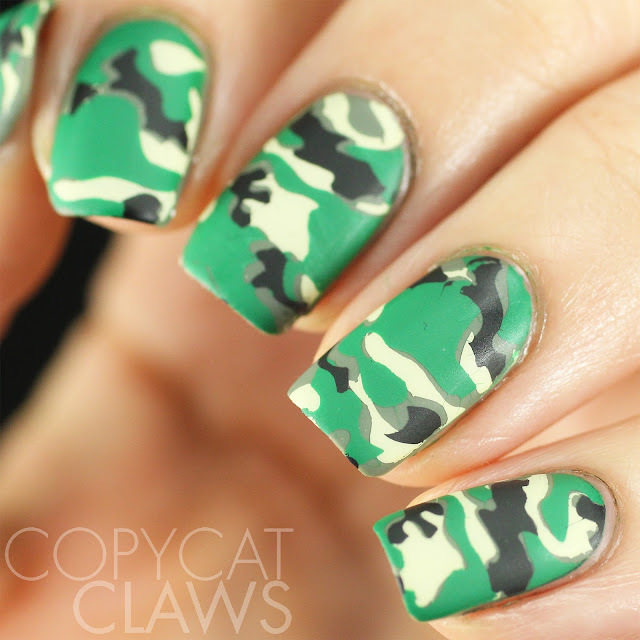 This is my other favourite mani of the day. 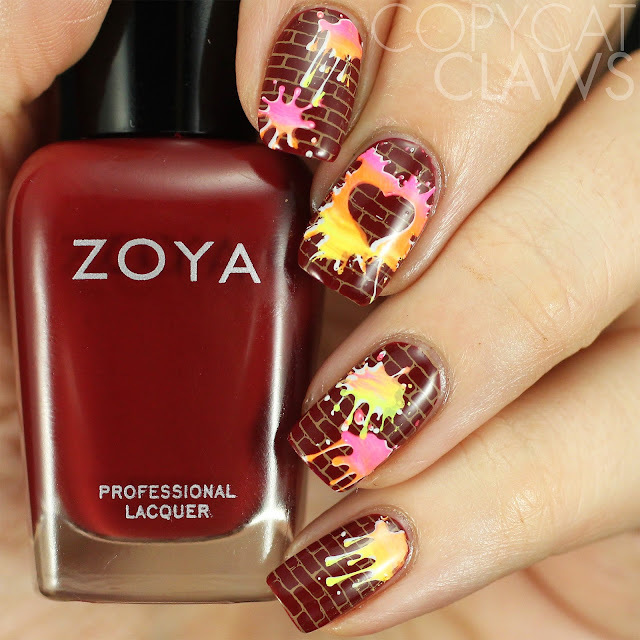 I used Zoya Pepper as my base and stamped the brick wall look with Mundo de Unas Caramel. 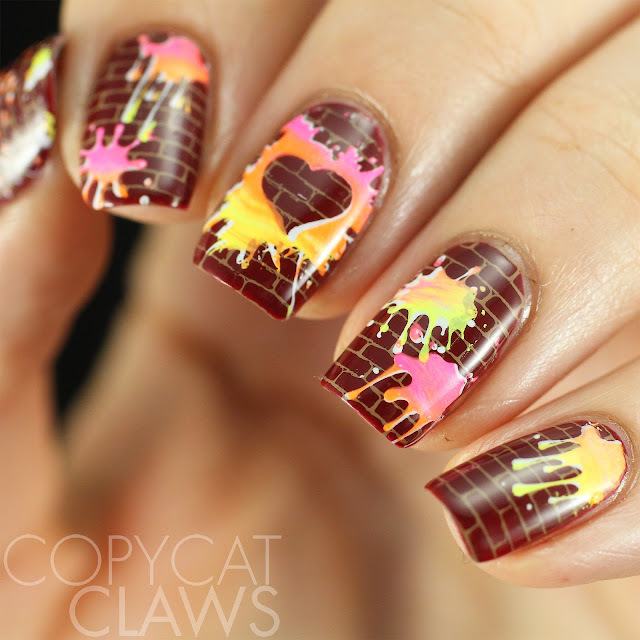 The splatters were stamped first with white and then res-stamped with Neon Yellow, Orange and Pink in a gradient fashion using a clear stamper. How fun is this!? Again, my second design is a bit less bright than the first. 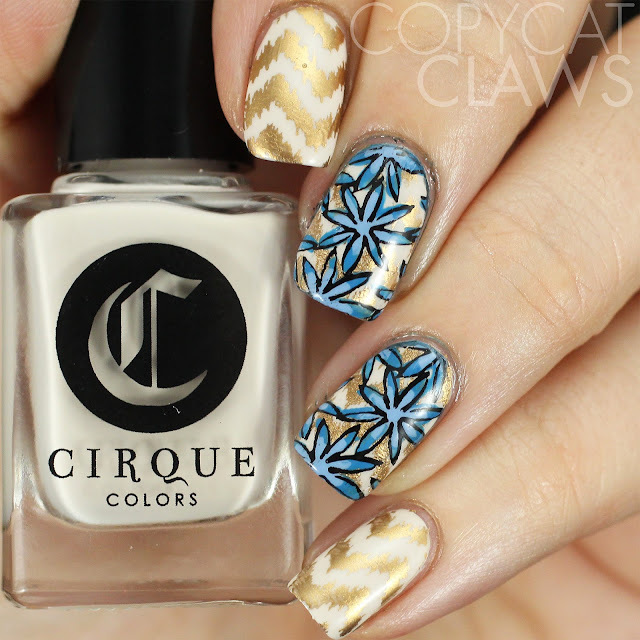 I used Cirque Don't Forget The Cannoli as the base, stamped with Mundo de Unas Bronze and then Advanced Stamped with the flowers filled with KBShimmer Little Boy Hue and Sky Jinks. 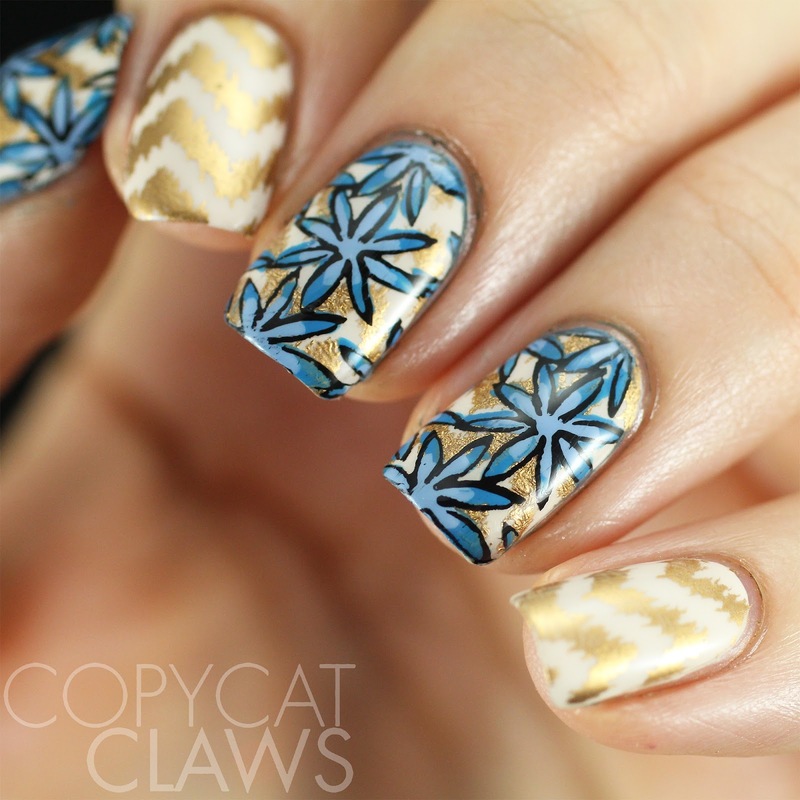 I love the grunge-y chevrons in this image. Very 90's. 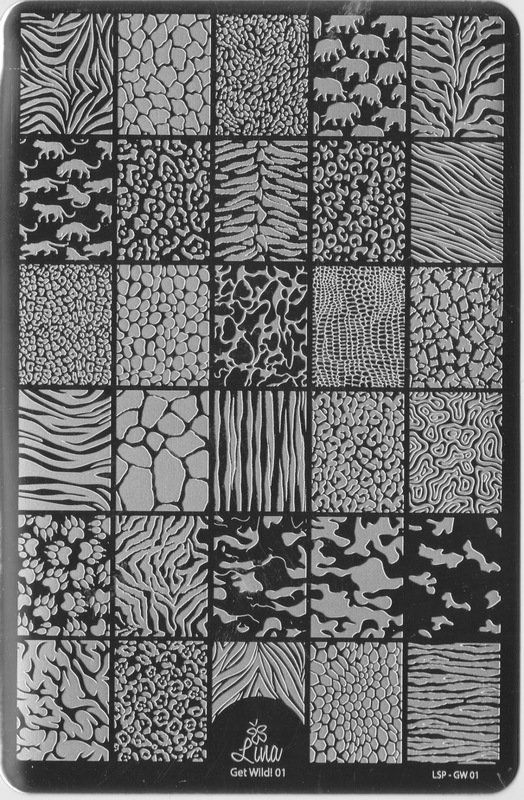 Lina has also come up with an animal print plate that's a must-have to anyone who has just started collecting plates. I've been collecting for years but I still specifically requested this plate so I could have all the animals in one place. And there's more than just animal print. There's also a few silhouettes and a layered camo image that I just had to take a stab at. At first I didn't even realize that the camo images (second row from the bottom) added up to one fantastic layered image. 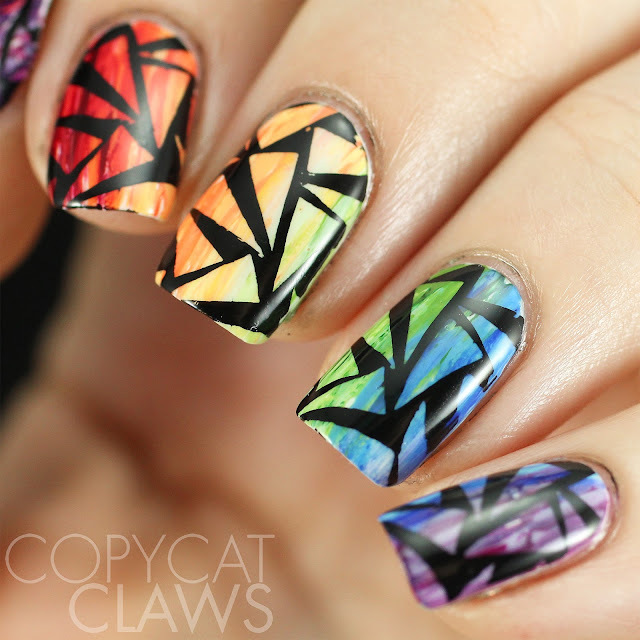 You'll definitely need a clear stamper if you want to line all these up. Lina suggested doing it on a mat but I threw caution to the wind and tried it on my nails. 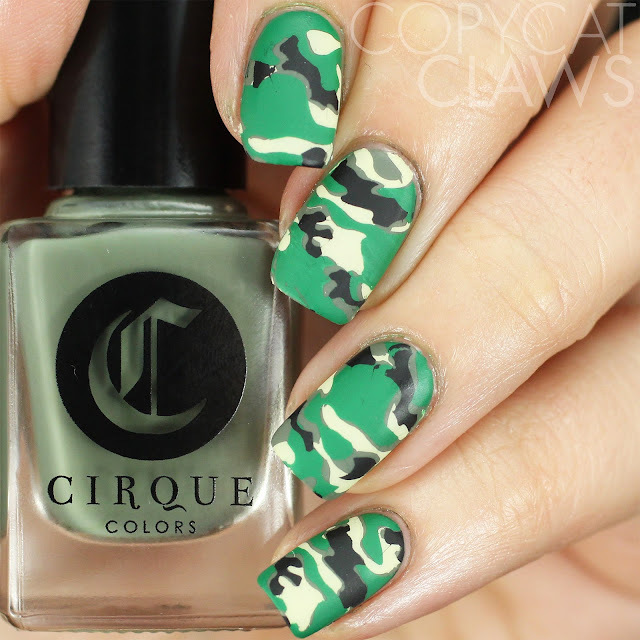 My base color of Cirque Central Park After Dark did peak through a bit but it just added another color to my camo, right? The images were stamped from left to right with Mundo de Unas Bones, High Green and Black, respectively and then matted with Essie Matte About You. 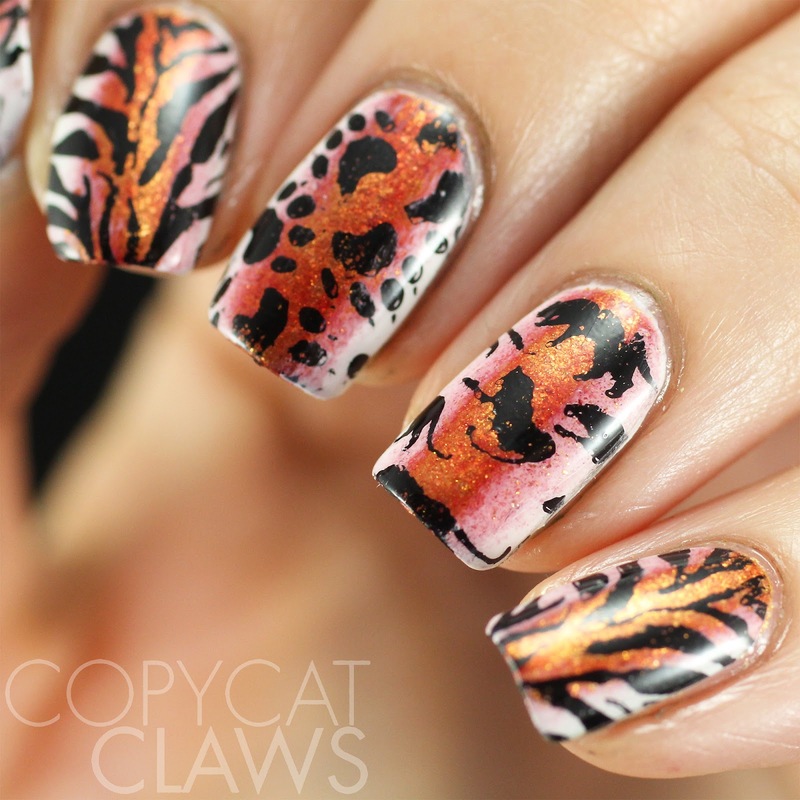 And finally, I did do one animal print design. I used a white base and then did a messy middle gradient with Pretty Serious Eat, Drink and Assimilate. All the stamping was done with Mundo de Unas Black. The big cats silhouettes ended up a bit splotchy but I was just too lazy to redo them. 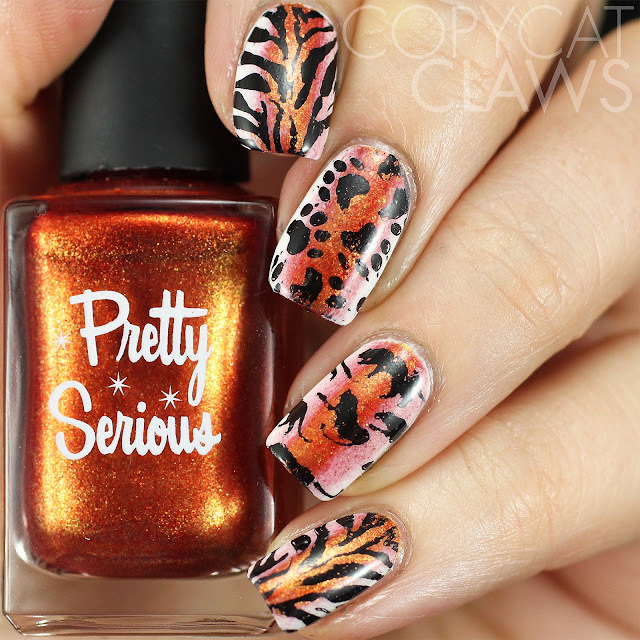 I was already disappointed with how red the metallic orange ended up looking so just stamped them quickly. 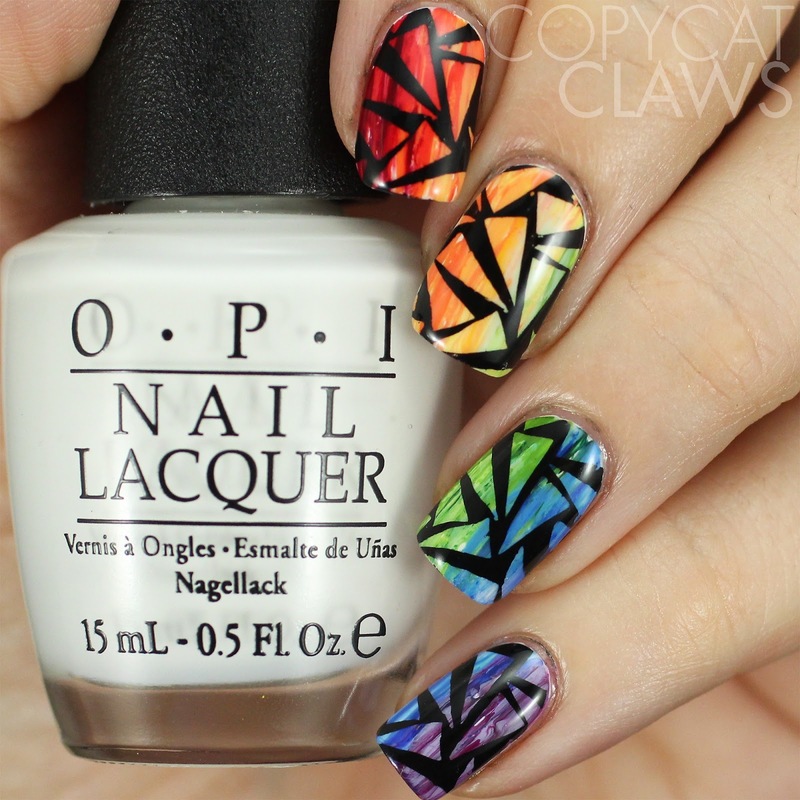 Definitely don't judge this plate based on this mani! I tested out quite a few images from this plate before deciding on the final look and they all stamped great with a variety of different polishes. Overall, I'm really struck by with the quality of these plates and the variety of images. There's a huge range of plates available, especially for a new brand. 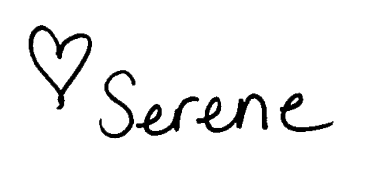 I'd highly suggest checking out their selection. 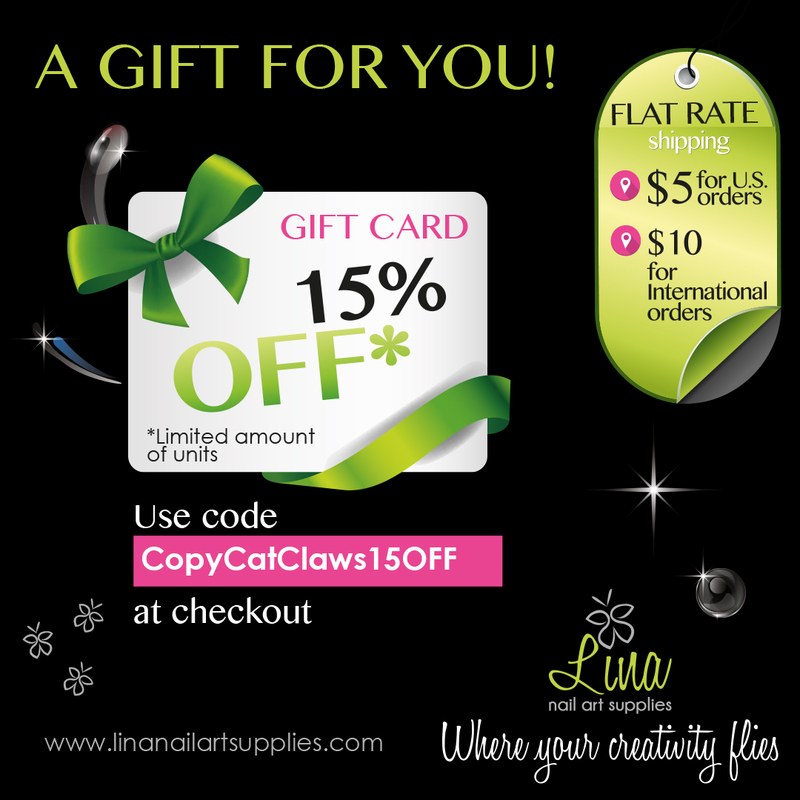 If you're interested in any, Lina was kind enough to give me a discount code for my followers. Use CopyCatClaws15Off at checkout for 15% off your order.